London is a truly amazing destination, a metropolitan city with something for everyone. From museums to landmarks, the theater, and shopping, there is something for everyone in London. If you have only 48 hours to spend in the city, be sure to check out some of recommendations for the best things to do in London and make the most of your visit. First, take an early-morning excursion to the Tower of London. Great for adults, kids, and family trips, the Tower is bursting with history and intrigue. See the Crown Jewels, the White Tower, and the famous Tower Ravens. Climb along the walls on your own or with a guided tour, seeing the sites of centuries of history, as well as the iconic London Bridge and River Thames. After visiting the Tower of London, head downriver to see Big Ben and the Houses of Parliament. Take a ride north on the Underground and hop off at St. James Park, where you can see the Princess Diana Memorial. Nearby is Buckingham Palace and Hyde Park, home of the famous Rose Garden and many memorials. If you’ve had your fill of history after Hyde Park, take lunch in Regent’s Park and see the London Zoo, Madame Tussaud’s, or the Planetarium. Finish with a dinner in London’s East End, where you can also see a play at the Royal National Theatre and take a spin on the London Eye. 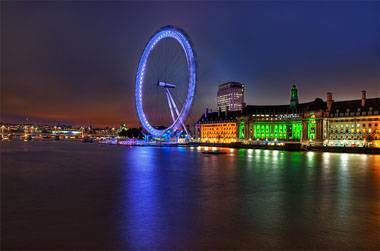 On a clear night, the London Eye offers spectacular views of the city. On your second day in London, hit up the British Museum, which is filled with thousands of years of history and culture told in a breathtaking expanse of artefacts. Greek statues, Egyptian mummies, prehistoric ruins, and more await on several floors of exhibits. After you’ve had your fill of the Museum, head down to St. Paul’s Cathedral. This stunning cathedral is beautiful inside and out, and the center of 1,400 of history. Afterwards, head across the River Thames to Tate Modern and the East End, where you can shop, eat, and view as much contemporary art as you like. Tate Modern offers guided public and private tours, as well as plenty of interactive exhibits for all ages. Top off your last evening in London with a spooky guided tour of Whitechapel, the haunt of the infamous serial killer Jack the Ripper. If that’s not your style, check out one of London’s thousands of pubs, the perfect place to eat, chat, and savor your experiences.